Three recording quality modes. Manage the trade-off between quality and recording time by choosing between long play, standard play, and high quality play. Long play records for up to 140 hours. Several file formats. 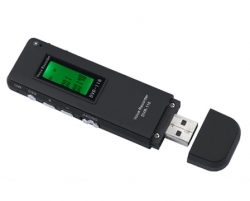 Its MP3, WMA, or ACT recordings transfer easily to your PC via the included USB cable.